IMPORTANT!!! 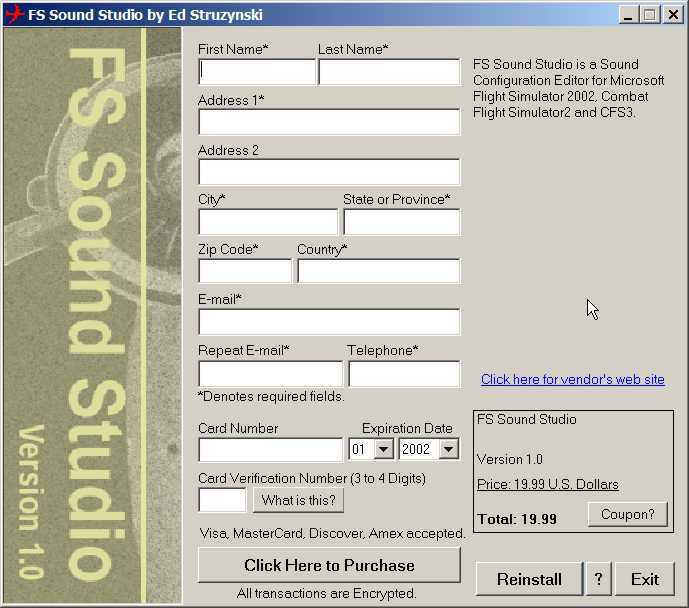 Unless you purchased FS Sound Studio after Oct 2006, your upgrade will require an updated key from Flight1.com. 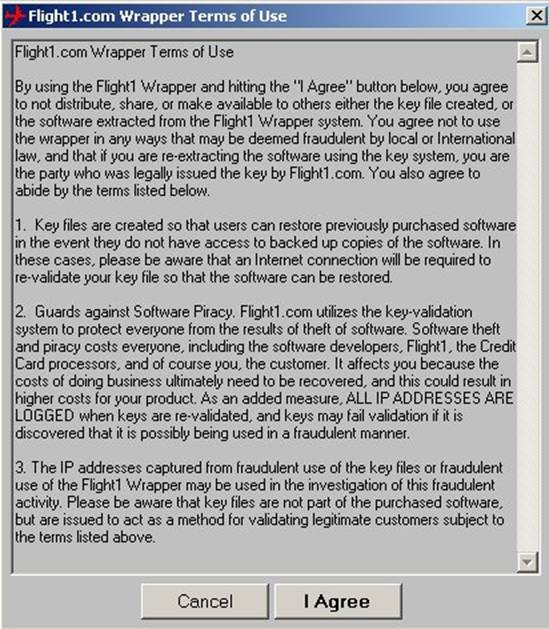 You can check your current key using the Flight1 Key checking program. 1. If you have lost your key and have your order number and original email address, go to https://www.flight1.com/view.asp?page=keyrequest to retrieve your key. Note: The order password when you use this key on FS Sound Studio will be the last 4 digits of the phone number used on the order. If you need your order password sent to you, see #2 below. 2. If you do not have your order number and/or password, but still have access to the original email address, you can click https://www.flight1.com/view.asp?page=lostorder to get your order numbers and/or password. 3. If you no longer have access to the email address used for your order, submit a ticket through the Flight1.com ticket system at http://www.flight1.com/ticket.asp and make sure you select the "Order Information Change" option. Note: It will be important that your mail or spam filters allow mail from Flight1.com. You can run a simple email test at: http://www.flight1.com/view.asp?page=emailtest to verify whether or not you can receive mail properly. If you cannot get a mail from Flight1.com, check your spam filter settings, or contact your ISP's technical support department and tell them about the problem. The following 9 step process will upgrade your copy of FS Sound Studio to the latest version. 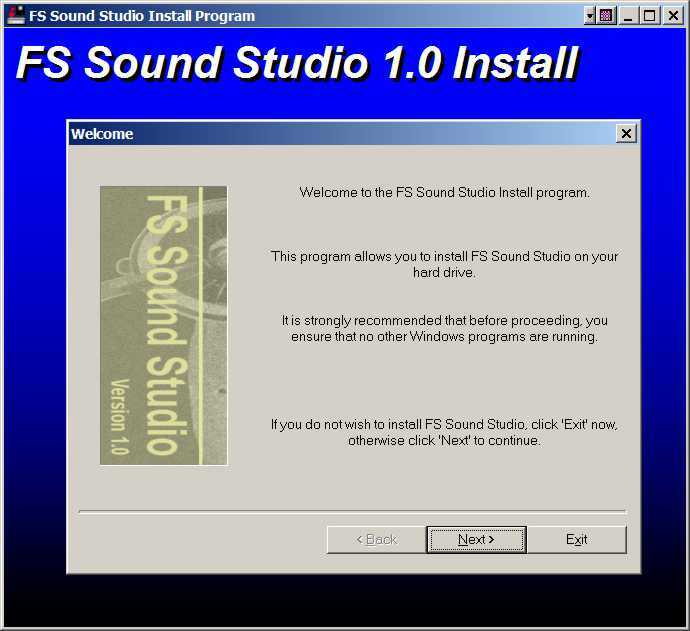 You do not need to have FS Sound Studio installed, but you will need your copy of the key file you received when you originally purchased FS Sound Studio. Download the latest e-commerce wrapped version of FS Sound Studio. Double click on the FSSSInstall.exe file to launch the installer, as displayed below. Click on the Reinstall button. Note that the screens may be slightly different depending on the version downloaded. NOTE: If you are asked for a password -- Passwords normally will be the last 4 digits of the credit card used for the purchase, a vendor issued password, or if the key is being upgraded from a previous wrapper version, the password will be the last 4 numbers of the telephone number used on the order, without spaces or dashes. You can retrieve your passwords via the Flight1.com Password Retrieval Page. You can check to see if your old key is compatible with the latest installer by running the Flight1.com key checking program. If this check fails, or if you see the following message when attempting to reinstall or upgrade, you will need a new key. Flight1 has improved the security and robustness of their download security tools. This means that if you purchased FS Panel Studio prior to March 15, 2006, you will have to replace your key to upgrade or reinstall your software. You can do so easily and quickly, 24 hours a day, at the Flight1.com self service key replacement page. 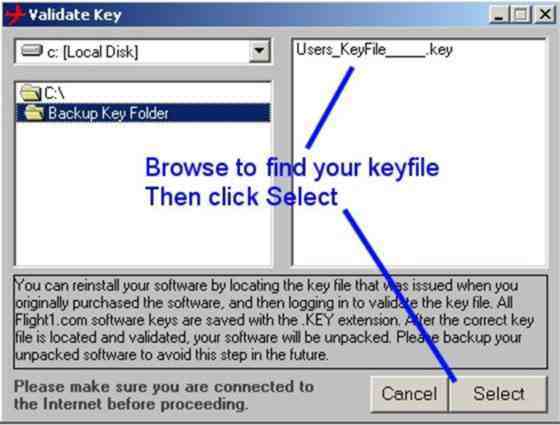 The original installation prompted you to backup your unique key file in case of problems or future need of reinstalling the program. Key files should be backed up to media other than your immediate hard drive such as a floppy disk or CD-Rom. Use the windows style browser to locate and select your key file. Make sure you highlight the key file you wish to use. You may have multiple key files, if, for example, you also have other Flight1.com titles. Make sure you select the key for FS Sound Studio. After locating and selecting your key file, and acceptance of terms of agreement, press the “I agree” button. The wrapper utility will now go online (make sure you are connected to the Internet and that your connection is working. - you may need to disable any firewalls or anti-virus programs which are running) and validate your key file. Once validated, you will receive a confirmation. The wrapper utility will now prompt you for a default installation directory. It is recommended that you accept the default directory. The wrapper utility will now extract the application to the selected folder and begin the installation process. The FS Sound Studio setup.exe program will automatically begin. Answer the questions to begin installation. To verify you have the latest version. select the "Help: About FS Sound Studio" menu pick, and examine the Build number displayed. Your upgrade is complete. Jan 15//2007: New version Build 7716 available with FSX support! "FS Sound Studio is an amazing tool... 10 out of 10..." read the full Simflight.com review. Other exciting FSX add on utilities and aircraft are available.